This is the question that we get regularly asked. This type of CV is most suitable for candidates with little or no work experience or education. This format is recommended for young people, school leavers, college students and those just entering the world of work. Note: If, however, they can fill up another page with more meaningful and useful information, they should do so. Anything that adds value to the CV and strengthens the job application should be included. The purpose and aim of the CV is to briefly inform the recruiter about education, work experience, skills and abilities. A CV should be short, to the point and convey all the relevant information. 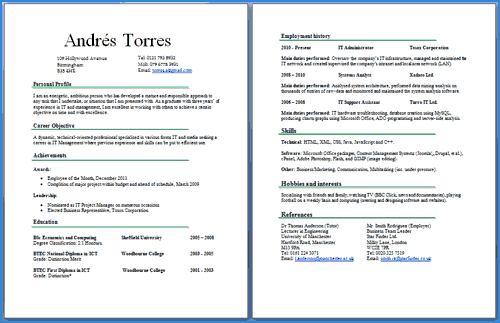 A 2-page CV is an ideal length for the majority of candidates. It is not too short, which may indicate a lack of work experience and education, and it is not too long to make cluttered, boring and unfocused. The reason your CV should not go beyond the two A4 pages is that employers only tend to look at a CV for about 30 seconds so any CV that looks long-winded, unfocused or ‘rambling’ will automatically be binned. This CV format is recommended for the majority of the applications, including young professionals, university students, graduates and junior managers. This format of a CV is only reserved for senior-level professionals who need the extra page(s) to present their most important work experience, projects and achievements to date. These CVs are more detailed and comprehensive as they are expected to outline their qualifications and practical experiences to date. This CV format is recommended for senior managers, executives, directors, consultants, academics and contractors. It is likely that once you start working on your CV, you will discover that you need more space to write down all your relevant information. Unless you are senior professional or executive, it is recommended that you cut down the length of your CV to a maximum of 2 A4 pages. Remove irrelevant jobs, qualifications and skills. Cut down on less-important sections of your CV (e.g. Personal profile statement and Hobbies and interests). Combine sections that are similar (e.g. the Achievements and Skills sections can be combined into one). Tweak the presentation of your information so that it takes up less space. Since there is no set length for a CV, it comes down to using your common sense to decide on the correct number of pages for your CV. Look at your level and your career history, look at the job role and then decide how many pages would be appropriate for your CV. A 2-page CV format will do the job for most of the applicants.